News just in from Patrick Coote, Marketing Manager of Fraser Yachts, includes several price cuts. 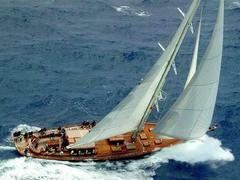 Firstly, Holland Jachtbouw’s 30.48m classic sailing yacht Sapphire, built in 1996, is now priced at $3.95 million through Penny Parrot in the Fort Lauderdale office. She’s now in meticulous condition, including a new paint job, and can be viewed in Newport from June 1st. Then there’s David Legrand in the Monaco office announcing that Azimut’s 30.75m Crystal has been reduced from €5.2 million to €4.3 million. Crystal offers striking charter opportunities and is very cost effective with an Azimut Charter Club package. Finally, Julian Calder in the London office has seen Lady Vista, a 31.18m motor yacht built by Marinverkstadema in 1954, reduced from $3.5 million to $2.5 million. And this after a €1 million refit in 2008!